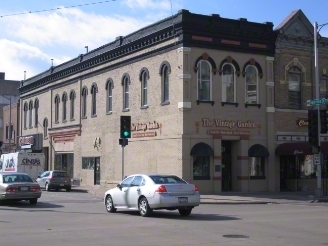 Posted on Dec 14, 2012 by Appleton Downtown Inc.
Prime location with excellent corner visibility in the heart of downtown Appleton. Plenty of parking adjacent to parking garage. Fully leased first floor with second story open to develop for future tenant income. The Fox River Valley of Wisconsin stretches from Fond du Lac in the south to Green Bay in the north. It encompasses the cities of Fond du Lac, Oshkosh, Neenah, Menasha, Appleton, Kaukauna, DePere and Green Bay. The total population is in excess of 700,000 and the Valley has been one of the fastest growing regions in the state. US highway 41 runs through the Fox Valley and is the main traffic artery between Milwaukee and Green Bay. In the Appleton area, US highway 41 had daily vehicle counts in excess of 80,000. The Fox River Valley and the Appleton/Oshkosh MSA have a very stable economy based on high-end paper production, insurance services, healthcare and other manufacturing. Household EBI in the MSA is $41,905 and the MSA is within the top 10% nationally in retail sales per household.